I belong to a local social group called the Movie Bears. We get together once or twice a month and do dinner and a movie. It is a nice way to meet other bears in the area for some low impact fun and socializing. The holidays made it difficult to get together. Our January meeting was the first one in over two months. The movie that we went to see was 13 hours: The Secret Soldiers of Benghazi. The trailers showed plenty of explosions, gun battles, and hot bearded men which made it a good choice for a movie bears night. My only concern going into the movie is that it was going to be heavy handed political piece about Benghazi. I was pleasantly surprised to find 13 Hours was not about the politics behind the Benghazi attacks. I am not going to go into the actual history of what happened at Benghazi. you can Google it and pick the news source that you prefer. This movie takes the tack of giving the perspective of six contract operators employed by the CIA. The movie does a good job of giving the audience a connection to these men. Each one is introduced and given a depth that one doers not expect from a movie that is focused on highly trained military operatives. Sure, there is still the ultra masculine camaraderie that is a hallmark of this sort of film. The flip side is that it takes the time to illustrate the human element of each man. In particular, there is a moment when Jack, played by John Krasinski, is being briefed by the station chief. The chief notes that Jack, like the other operators, is married but doesn’t wear his wedding ring. The chief wonders why he, and all the operators do this. Jack points out that part of his job is dealing with possible enemies. It is never a good idea to give an enemy another tool that could be used against you. This focus of family is a thread that is weaved throughout the men’s interactions throughout the movie and connect the audience to these characters. 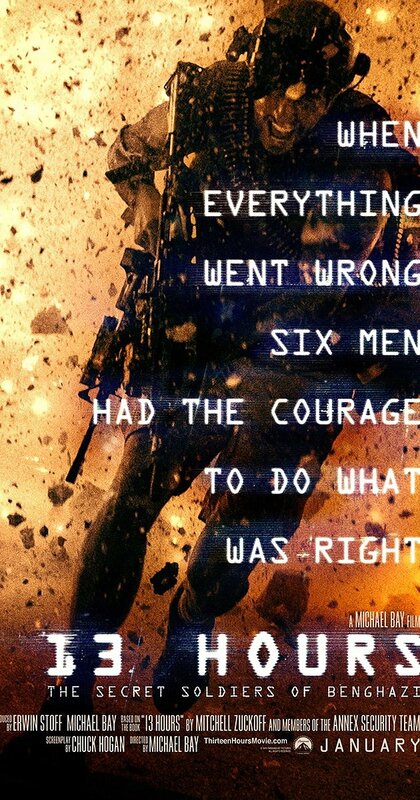 13 hours is a good movie with some problems. It is an action thriller that delivers what one expects from this genre. There are plenty of good fight scenes and tense interactions between characters as things go south. My concern was that the movie would have difficulty maintaining the tension when the ending is well known. This is not the case. The connection to the characters that the movie creates draws you in and allows you to just be in the moment and the tension is right there. This is possible because Krasinski, Fumua, Dale, and the others performances are all solid. What could have been easily very stereotypical performances are given a depth which was nice to see. The problem arises from the movies heavy handed message of elitism. throughout the movie, the six operators are portrayed as the long-suffering parental types. Each has been through similar circumstances and knows how the enemy works and is trying their best to protect their charges. The CIA operatives are portrayed as viewing these men as nothing more than attack dogs to be let off the leash sparingly. There is one scene where the leader of the Six is trying to convince to allow the and his men to do something. The chief points around the room citing degrees from places like MIT and Harvard and that maybe the thinking should be left to those better prepared for it. The movie hammers home that this elitism is what costs so much life in the end without ever seeing that this perspective is just as elitist. I would give 13 Hours two bear paws out of four. Definitely worth seeing as a matinee viewing but does not require extra viewing. I recently went to see leonardo DiCaprio’s new Movie. I had seen the preview for the movie a few times when at the theater and it seemed interesting. It appeared to be in the vein of Legends of the Fall or The Last of the Mohicans. Stunning natural vistas threaded through with an underlying story of vengeance. I can get behind a good vengeance story. Let me start off by pointing out that this movie has a running time of 156 minutes. I do not mind long movies. A good long movies makes you feel like no time passed while you were watching it. That was not the case with the Revenant. It felt like all of those minutes and then some. It appeared that Inarritu wanted the audience to feel the weight of time in this movie and he accomplished this goal but not in a positive fashion. 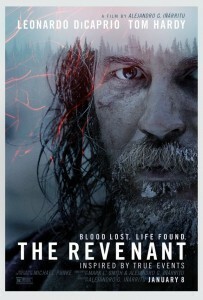 The Revenant tells the tale of Hugh Grant. Hugh is a scout on a trapping expedition in the wilds of America during our early history. He and his son are assisting the band of trappers with getting their goods safely from the wilds back to civilization. The expedition is brutally attacked by local native Americans and are forced to flee to the river after having lost over half of their men. The main story is that of Hugh Glass. He helps the remaining men find a path that will lead them to safety. In so doing, he is brutally attacked by a mother bear protecting her cubs. The band discovers his almost lifeless body under the corpse of the bear and attempt to take him with them on their trek to safety. Finding this impossible, Hugh is left with Fitzgerald, Bridger, and his son, Hawk. They are to see him to his end, bury him, then catch up with the group. The waiting is interminable and Fitzgerald decides to send Hugh to his creator early and is interrupted by Hugh’s son, Hawk. Hawk is murdered and dragged deeper into the woods and Fitzgerald convinces Bridger that they will soon be overrun and they place Hugh in a shallow grave. What follows is the story of Glass struggling for survival while trying to make his way to the fort that should be housing the murderer of his son. I mentioned above the stunning natural vistas. They are as much a character in this movie as Glass or Fitzgerald. There is a scene where set at a waterfall. The camera lovingly explores the beauty of the ice and the water in, through, and around it. The focus coming ever closer to single circular point of ice through which the water burbles. This care is given to scenery throughout the movie. Inarritu sets up the background as both beautiful but uncaring background witness to the suffering of Glass. It is as if nature is saying, “Suffer…my beauty is unmarred by it and will endure.” An extra layer of darkness in a bleak movie. Still, these scenes are visually stunning. My problem was that I had difficulty buying DiCaprio as the man driven by vengeance to endure such privation. his dialogue is sparse so that as a character he feels shallow. The flashbacks that are to give us a glimpse of what made him this person are more confusing than enlightening. As the movie progresses, the audience is treated to hallucinations that speak of a spirituality that seems to have no root. when it blossoms at the end, it feels false and tacked on. Tom Hardy delivers an excellent performance as the antagonist though. He makes horrible decisions for which we get to see the reasoning behind as well as the consequences. His dialogue, though sparse as well, still informs the audience who Fitzgerald is. His performance actually highlights the weaknesses that were very apparent in DiCaprio’s time upon the screen. Overall, I would say that The Revenant was a good movie. It has the feel of Oscar bait for DiCaprio, which it most certainly is. It provides a cinematic experience filled with natural beauty and suffering ensured for revenge. In the end, I was unconcerned about the outcome as it was a forgone conclusion. I just wished the conclusion could have come sooner. The Revenant gets two out of four bear paws from me. It was good but could have been a bit less self indulgent. Time spent on nature could have been cut while still making me more connected to someone other than the villain of the piece. I know, I am a few days late. The holidays are over. I have a few seconds to breathe and I thought I put up a post to talk about the last year, explain where I’ve been for the past few weeks, and discuss the coming year for Geek Bear’s Den. Geek Bear’s Den is my first internet project. I have had a blog over on blogger but that never seemed the same as doing something like this. I spent about two and a half years writing for Zero Fortitude and Ideology of Madness. Both of these sites are Podcast based and I started writing for them to give them content for their websites. It was a wonderful experience and they are great bunch of people that I am grateful to have met and worked with. I recommend swinging by the sites and checking them out. My posts on Zero Fortitude are sadly very few as they had two site crashes due to hacking which led to most of posts being lost. You will have to go back about a year on Ideology of Madness but my posts are still there. It was in the beginning of 2015 that several of my friends gave me the push to start my own site. They helped me with the technical aspect as well as the confidence to just go forward with the idea. It was a little nerve-wracking in the beginning. I was worried about what I was writing about and would people read it. It took a few months for me to get over this nervousness as well as the worry about what people might think about what I was writing about. It was nice to get to this point and be able to move forward without that weight. I have been bad at posting over the past month and a half. The holidays have kept me busy. In addition, I started a new job that has the requirement of passing a test at the end of January in order to keep it. They have been training me both to do the job as well as pass the test. I have been using what time I have available to study for this test. It definitely has been stressful but well worth the effort. the plan going forward is two-fold. First, I am going to endeavor to have at least a post every week. I fell behind on this at the end of 2015 but one post a week is an easy schedule and I am going to hold myself to it. Secondly, I am going to not worry so much about the topics I chose to write about. The general gist of the posts will still be reviews about geeky things but I will feel more confident to just throw in personal post about me and the things that I am thinking about or working through. Thanks for reading Geek Bear’s Den during 2015. I hope that you stick around for 2016!